Sure, you could run just about anywhere in the world! But wouldn’t you prefer to run on a safe, beautiful Caribbean island, surrounded by tropical flora and fauna, charming homes flawlessly landscaped and magnificent views of the sea? 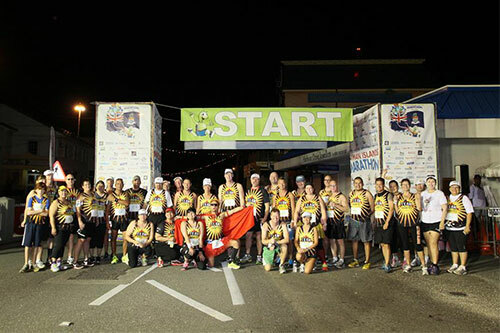 Well, come run with us in the Intertrust Cayman Islands Marathon! The 2019 Intertrust Cayman Islands Marathon takes place on the Sunday, 8 December and consists of a full marathon, half marathon, 4-person relay and a Kids Fun Run. The race is only in its 17th year but we're growing! Our reputation is that of a intimate, warm, friendly, well organised event, and we hope you'll come and experience it for yourself. They Loved Us! You'll Love Us Too...We Guarantee It!!! Read what others had to say about us! "Just wanted to say a big 'THANK YOU' for all the excellent organisation and effort that you and your team must have put in to make the Marathon such a super event! My friend and I had a fantastic time. It was so much fun and the atmosphere was awesome. We will definitely be doing it again next year! Thank you so much." "I had a GREAT time at the marathon. The expo was terrific, the pre/post-race area was well-equipped, the course was nice, and the aid stations were absolutely amazing. I loved having bottled water/gatorade, as I could carry it and drink between aid stations without spilling it everywhere. I also loved the race announcer calling out my name at the end -- awesome." "This is probably the friendliest (half) marathon I’ve ever run! 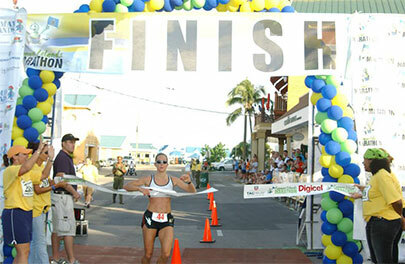 If you plan to be on Grand Cayman Island in early December, you need to schedule your visit around this race!" "I had a great experience at the marathon. Thank you to everyone who made it all possible! I especially want to thank all the water stop volunteers - they were all AMAZING! I couldn't have finished without them." "I want to personally thank you for a fantastic marathon experience. I made up my mind a year ago to run a marathon to celebrate my 50th birthday. I spent a lot of time selecting the perfect race and I couldn't be happier with my choice!!! I know how much time was spent planning and organizing and I want you to know that I truly appreciate it. Your marathon was a first-class act!!!" It’s easy! The Cayman Islands are just 480 miles south and an hour plane ride from Miami, Florida. Delta, Continental, American, US Airways, Air Jamaica, Air Canada, Northwest, British Airways and Cayman Airways all provide service to and from Grand Cayman. Gateways include Houston, Miami, Tampa, Atlanta, Charlotte, Philadelphia, Washington D.C., Kingston, Jamaica, Chicago, Newark, Toronto, Detroit, Minneapolis, New York and London. The race route is IAAF-sanctioned and is flat and fast, ensuring ideal running conditions. If that isn’t enough, there will be music along the route to motivate runners and add some ‘flava’ to the mix. The course will take you through the financial district of George Town, along the beautiful waterfront and through some of the more exclusive neighborhoods on the island. Many runners use this route daily and can attest to the safety and quality of the course. The Cayman Islands is a warm weather destination year-round but we selected one of the cooler days of the year for you to come and run with us. Expect the start line temperature to be in the low 70s meandering into the low 80s by the end of the race. B.Y.O.F…Bring your own friends…or family! Don’t come alone! Make sure you bring your family and friends along to take advantage of everything the Cayman Islands has to offer. Spectacular natural beauty, a wealth of activities and points of interest, and all the modern conveniences to make your stay as comfortable as possible can be found on Grand Cayman, the largest and most developed of the three Cayman Islands. For a vacation within a vacation, visit the beautiful, serene Sister Islands of Cayman Brac and Little Cayman. Just log on to the official website of the Cayman Islands Department of Tourism (www.caymanislands.ky) and start making your plans today!